Camera phone ready gimbal is packed with tech. 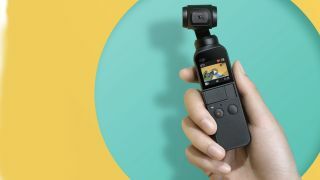 At an event in New York, DJI has taken the wrappers off of its latest play thing - the DJI Osmo Pocket. Its latest gimbal is, well, tiny. It's a 3-axis stabilized handheld camera that adjusts its movements so that the footage shot with it is as smooth as possible - so smooth DJI calls it "cinematic". When it comes to specs, the Osmo Pocket offers: 1/2.3-inch CMOS (Effective pixels: 12M), with a F2.0 lens with a 80° field of view, 100-3200 ISO range and the ability to shoot 4K video. Dimensions-wise, the Osmo Pocket is a mere 121.9×36.9×28.6mm in size and weighs just 116g. It's a very different kind of product, but it looks like it could compete with the best action cameras for everyday fun and usability. The DJI Osmo Pocket can work standalone, but when you pair it with a phone you can add filters and soundtracks using DJI Mimo, the accompanying smartphone app. This app essentially allow you to create edited movies on the move. When it comes to price, it's a little on the steep side. The DJI Osmo Pocket will cost $350/£329 and you can pre-order it now.